Protect Your Home the Smart Way. Secure your home with a monitored home alarm that you control. These are professional security alarm systems installed by a leading Irish security company. Commercial grade equipment at residential homeowner prices. Get peace of mind 24 hours a day with a system that includes top quality CCTV cameras, motion detectors, control panel, door and window sensors. Control the intruder alarm system via an app on your smartphone. Switch alarm on and off wherever you are and access live images of your home at a touch of a button. Straightforward security systems that are tested to the highest standards. We fit and install these home alarm systems nationwide and have a local monitoring centre to provide peace of mind for you. Each security system includes a control panel with two window sensors, two door contacts, a PIR motion sensor, a PIR camera sensor, a bell box and remote control fob. The app is free to download and will work with iPhone and Android. We design, supply and install the system for you to ensure it meets your security needs. Our monitoring service will provide cover 24 hours a day every day of the year. We will alert a key holder should an alarm activate and can also liaise with the Gardaí if required. 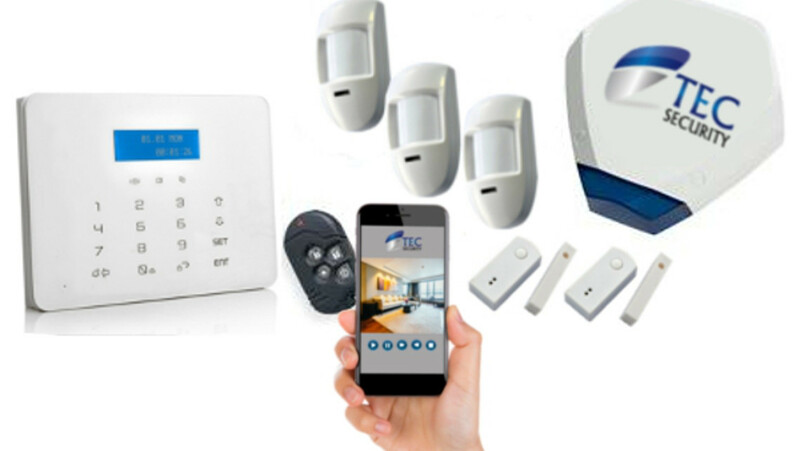 TEC Security have over 20 years’ experience in professional home and commercial security system installation. Our skilled technical team will provide the system that is right for your home at a cost effective price. For a competitive quotation or to get more information please call us on 00353 1 404 5124 or email info@tecsecurity.ie.